CP Shutters has become one of the largest independent Interior Shutter specialists in the whole of the UK. We are very proud to be Essex Number 1 Interior shutters specialist and have designed, built & installed thousands of Shutters throughout the entire Essex area since 2007. The core reason for our resounding success is our dedication to 100% customer satisfaction with every client we serve. 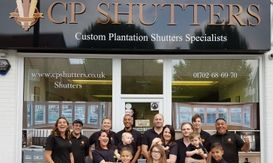 CP Shutters is and always has been a family run business, this means we do not recruit commission based salesman, we do not outsource our installation (like many blinds shops), every member of the team is part of the CP Shutters family, fully trained & qualified in their area, be it surveying, qualifying and installation. We can provide a personal, friendly service that you wont find anywhere else, our commitment is to provide the highest quality interior wooden shutters with the many years of experience we have!